The Orpington originated from the village of Orpington, Kent and was originally bred by William Cook. It was intended as a dual purpose bird and is a prolific layer and a good table bird. The duck was created by blending the Cayuga, Runner, Aylesbury and Rouen. The Orpington is great fun to breed as a hobby, although getting the colour perfect isn\'t easy. They normally look quite smart as they don\'t show dirt as much as white-plumaged ducks. Buff is the most popular colour and the other colours white, black, chocolate and blue have all but disappeared. 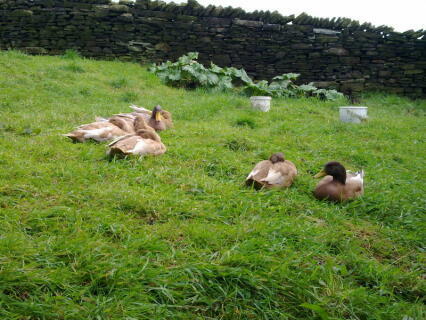 I noew have 5 pairs having brought in a different line to go with the drakes I bred this year. More drakes than ducks. My original pair certainly have no interest in sitting on the eggs so had to use incubator with little success, perhaps 1 in ten hatched. The various breeds of chickens I have hatch easily in the same incubator (not at same time). So hopefully next year will see all the girls sit on eggs. They share a large pen at night with call ducks and have access to a pond and then the fields. Very messy if its wet as it is here then they will soon turn it into mud, but great looking and the eggs are superb. I do feed them duck pellets as well as we are breeding from them and need them in tip top condition. Seem hardy but at 900ft above sea level I did bring them in when it gets really bad. There are pictures on my website littleliongardens.com (apologies for mentioning the website if I am not allowed) and I am starting to use facebook so when there some for sale I will post the information. 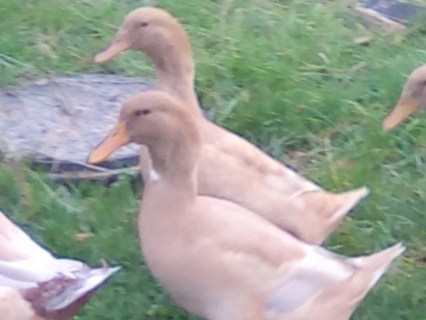 We have 1 drake and 3 ducks and they are wonderful ducks. Really friendly, easy to keep and great to watch. They are brave too regularly chasing our Jack Russell and anything else that comes into their garden. They dont fly, they can though with a big run up, they dont need a full pond a couple of paddling pools will do and they lay all spring and summer. 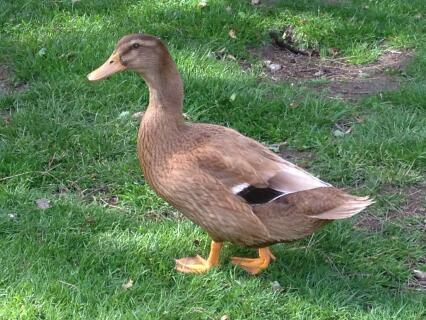 Lovely breed of a duck good with kids and funnny to watch. The most clever ducks in the world. 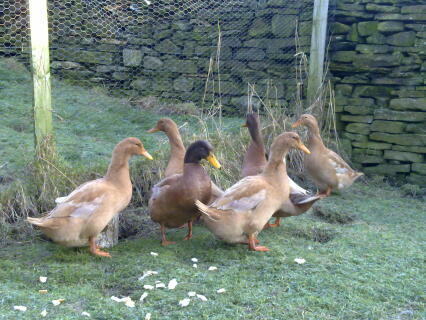 Beautiful ducks, I have one drake with three ducks, two of which are quite young. The older lays an egg a day and I am hoping the others will soon follow suit. They roam the garden all day, feasting on the pests, which certainly cuts down on the food bills, then put themselves away at night....fantastic ducks for lazy people!